Poyner Spruill LLP is a US law firm with around 250 staff across four locations in North Carolina. Poyner Spruill combined SharePoint 2007 with MacroView DMF to create a solution to replace their previous Docs Open 4.0 DM system. This SharePoint + DMF solution has been in production since June 2010. It is proving popular with users and also enabling Poyner Spruill to rationalize all their content management activities on a common SharePoint platform. Poyner Spruill‟s vision was to use SharePoint to create an enterprise-wide content management solution – appropriately called „p.s.empire‟. Prior to implementing MacroView DMF, Poyner Spruill was already using SharePoint to handle the client extranets (p.s. portal), the firm‟s intranet (p.s.net) and public web site (p.s.web). The missing piece was using SharePoint as the DM store (p.s.hub) – holding client and matter-related documents. CIO Ellen Kinsinger, notes: “At the time, the prevailing chatter was that SharePoint was not ready for Document Management. Then we found MacroView DMF, which layers on top of SharePoint to fill gaps in DM functionality”. MacroView DMF was in line with Poyner‟s preferred approach, which was to leverage the native capabilities of SharePoint and Microsoft Office and thereby avoid the constraints of traditional proprietary DM systems. 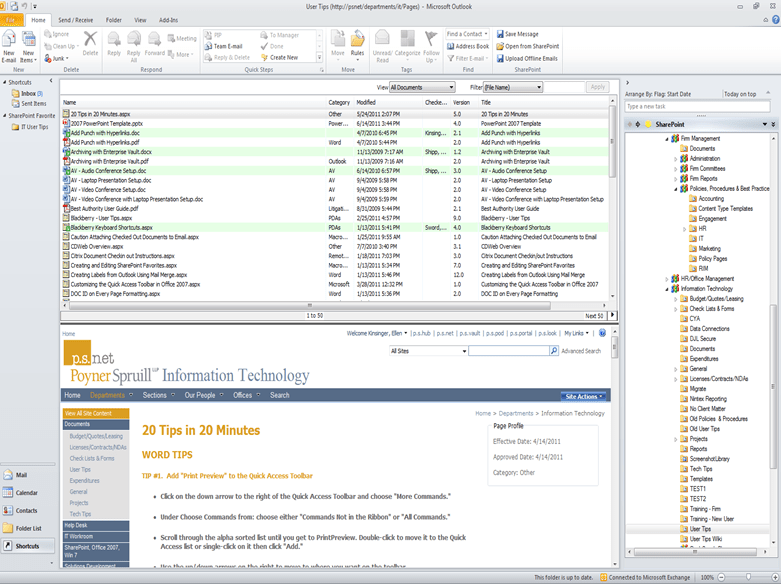 In addition to enabling SharePoint to be used to replace the previous Docs Open system as the DM tool for client and matter-related documents, MacroView DMF is also providing Poyner Spruill users with a consistent means of managing document content in client portals and the intranet – i.e. across the whole „p.s. empire‟. SharePoint definitely does things differently from a traditional DM system, such as Docs Open (or Autonomy Filesite, OpenText eDocs, etc). MacroView DMF assisted with the transition by providing extended DM features and a user interface that had familiar elements. However Poyner Spruill took that view that it was better to train and support users as they grew accustomed to the new SharePoint ways of doing things, rather than to attempt to reproduce exactly the user interface experience provided by the old Docs Open system. It is the case that permissions in SharePoint are based on inclusion rather than exclusion of users and groups, which is a source of consternation to legal firms that have utilised the deny-style security that is available in traditional DM systems. Poyner Spruill enabled deny-style security by means of a relatively simple custom solution that relies on the tight integration between SharePoint and Active Directory. Desired permission settings are entered into a SharePoint form and recorded in a SharePoint list. New A/D groups are then automatically created and assigned to libraries and sites as specified. Search in SharePoint proved to be a rich source for implementation challenges. These included the Search Indexer not recognising certain file types as documents, matching on only the first 50 characters of attributes and performance being impacted significantly by the ordering of terms in search queries. These and other search issues were resolved as more experience with SharePoint was gained. Another implementation challenge related to the confusing wording on the dialog displayed by Microsoft Word as a user closes a document that he / she had checked out from SharePoint – users were losing all the changes that they had made since they checked out the document, despite having saved regularly. Poyner Spruill addressed this issue by training. MacroView has also developed a DMF extension that displays a much more user-friendly dialog on document close. The new SharePoint content management environment is proving popular with users, who are finding that MacroView DMF provides a consistent means of managing all forms of document content. Poyner Spruill is also pleased that all their content is now managed on a common SharePoint platform. This is helping to reduce IT costs associated with support and maintenance of multiple platforms. A further real benefit is that Poyner Spruill is now freed from the constraints and costs of a proprietary DM system.